Yogurt is a traditional fermented dairy product known worldwide. It is produced by the fermentation of milk with the symbiotic action of L. bulgaricus and S. thermophilus. It is mostly appreciated for its nutritional and health benefits. Freshly prepared yogurt combines all of the desirable characteristics of a health food that is natural, wholesome and balanced in nutrition. 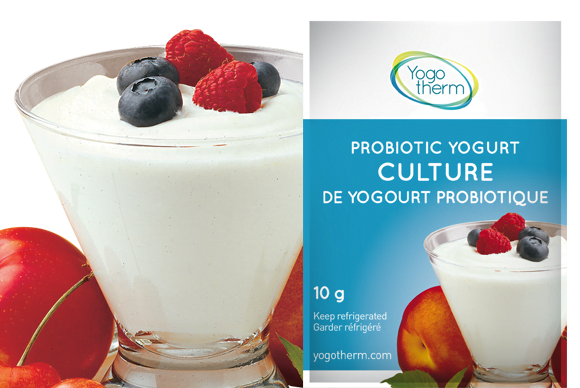 Making a homemade Yogotherm yogurt insures that your product contains live and active probiotic cultures that contribute to your health and well-being. For a firmer yogurt: before heating, add 3 tbsp. of milk powder to each liter of milk. For a snack, top with fresh fruits, cereal, honey or anything you like! Yogurt is the perfect complement to any meal. Use it to perk up your salads. It can also be used in marinades, sauces or breads and cakes.